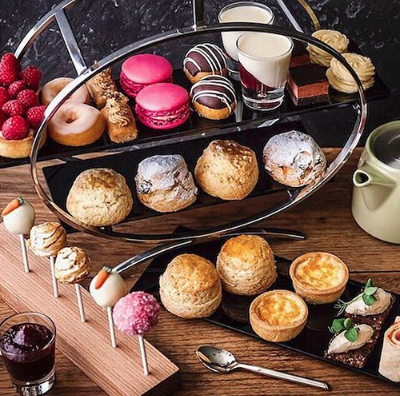 Whereas someone once said, you Can't Buy Me Love, you can in fact buy Afternoon Tea and in all honesty that's a kind of love I'm happy to settle for! Step inside the Hard Days Night Hotel, Liverpool's very own Beatles themed abode set in the heart of the city that rocked the world. Tea is taken in the hotel lounge, where you'll find black and white photos of the Fab Four lining the walls and even framed lyrics in Lennon's famous handwriting. It's themed yet maintains an air of sophistication with its modern leather furnishings and dark wood accents. It would be very easy to go a bit Beatles mad in such a venue yet this place banishes the tacky in favour of subtle decoration. 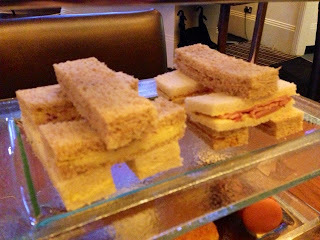 This summer there are a few Afternoon Tea options on offer with the introduction of the restaurant's Summer Cooler's menu. However, I stuck with old faithful and went for a traditional tea. The arrangement was really impressive. I absolutely loved the frosted glass tea stand - almost as much as I loved the pretty array of cakes! The start I had a selection of sandwiches including cheese, ham, egg and salmon on a good range of breads and just the right size. No prizes for guessing my favourite - salmon! Next up, it was the scones turn to shine. 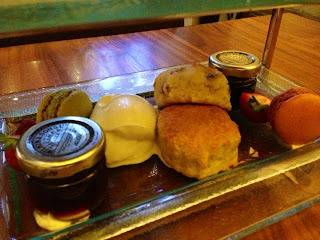 Beautiful warm fruit scones with jam and cream presented in a nice big dollop on the side - delicious . I really liked that there were two jams to choose from - strawberry and blackcurrant - and have now discovered how well blackcurrant jam goes with cream. 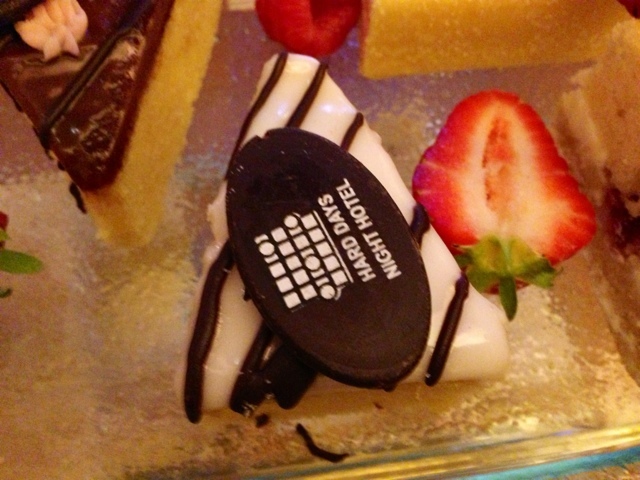 Finally, my favourite part, the dessert selection. Hard Days Night offers a really varied selection of cakes, not too heavy and not too repetitious either. 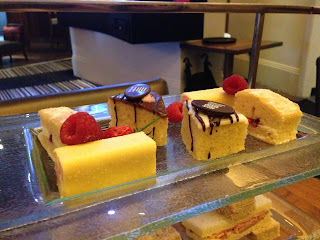 This included battenberg, super fluffy Victoria sponge, lime and blackcurrant macaroons and a chocolate cake complete wth Hard Days Night print on top. The macaroons were particularly tasty, especially in such juicy flavours. The one minor let down here was the fact that the desserts were not home made. I think that if the hotel were to add a few signature cakes to its Afternoon Tea, then it could become a real hotspot for seasoned tea lovers. It's also worth noting that we were simply given the option of tea or coffee, which for me will do just the trick, however I can imagine some tea connoisseurs might expect a little more in the exotic tea department. 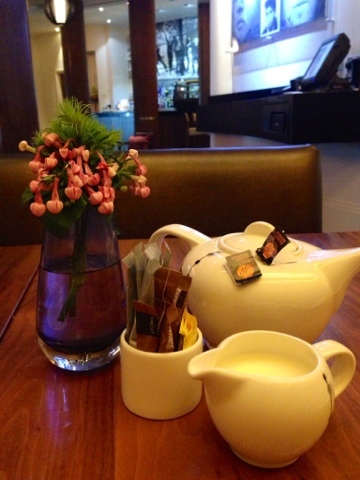 Moving back to the positives, I must say the service at the hotel was really great and the staff were very attentive, making sure my teacup was constantly topped up - overall a really pleasant experience. If you're in the city for a shopping trip with friends and looking for somewhere to relax, I would definitely recommend booking yourself in. Hard Days Night is located on North John Street, Liverpool. 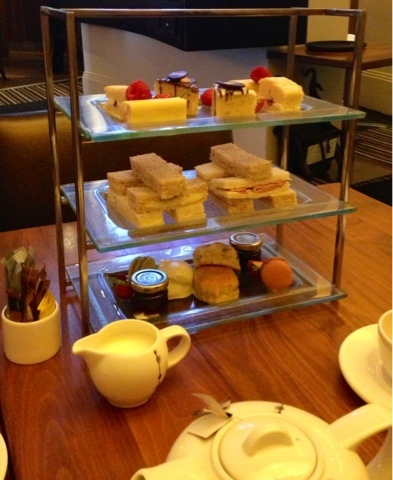 Afternoon Tea is served daily in The Lounge with prices starting at £17.95 pp. for a standard Afternoon Tea. For more information and to book please visit their website here.